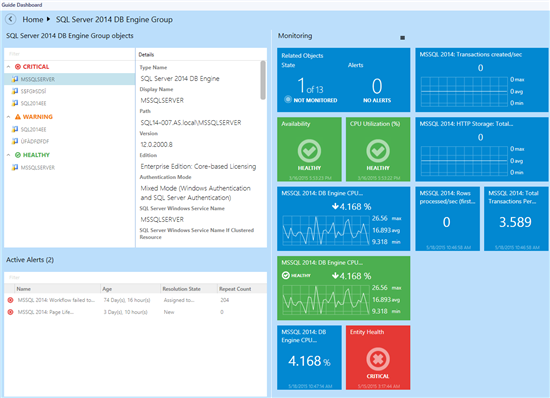 Yesterday I noticed that a new release (version 6.6.2.0) of the SQL 2012 & 2014 management packs has just landed and there's a lot of people out there who've been waiting on them. 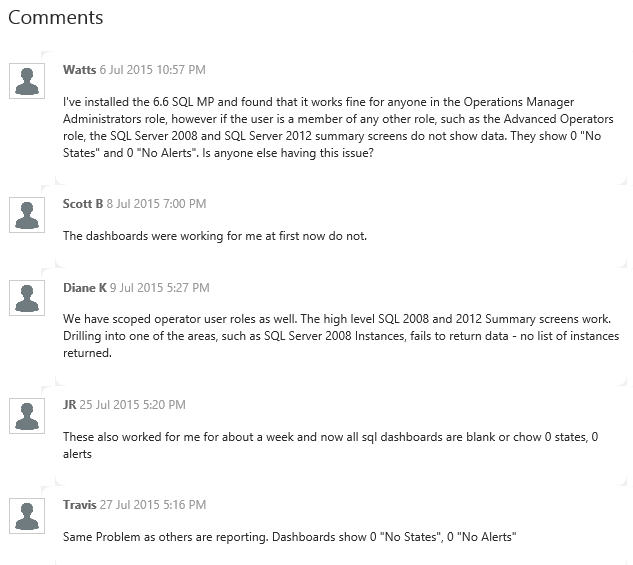 Important Update - 21st October 2015: There have been a few reports about a bug in this latest management pack - which seems to have also been present in the previous MP release - where the SQL database logs on your DW server can fill up in certain scenarios. 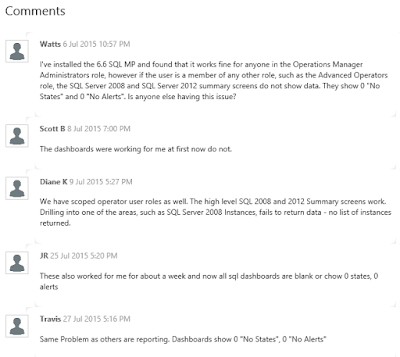 For this reason, it's a good idea to hold off deploying these MP's into production until Microsoft release a fix for this (as far as I know, Microsoft are aware of the issue and are working on a solution). I've deployed this updated MP into my lab and so far, it seems to have fixed the issue for me - although it took a few days to manifest itself in the last MP so let's see how this one goes! There's also a few new visualization options that you can choose from as you can see from Microsoft's post on the new MP's here. 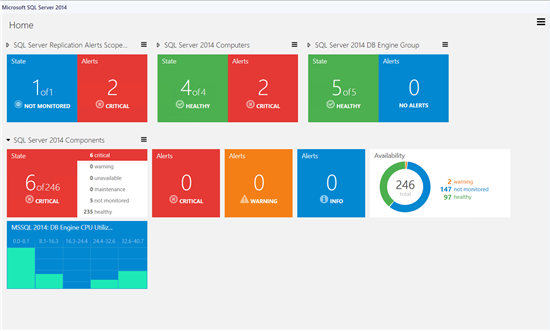 You can download the new SQL management packs using the SCOM MP Wiki or directly from here (SQL 2012) and here (SQL 2014). Note: As of the time of writing this post, these updated MP's are not available through the built-in catalog option in SCOM but I'd expect them to light up there in the coming days too. My System Center Universe Europe 2015 Presentation Video is Now Live! A few months back, I had the pleasure of presenting a session with my good friend Damian Flynn at the System Center Universe Europe 2015 conference in Switzerland and today I've noticed that the video recording for our session has just gone live. 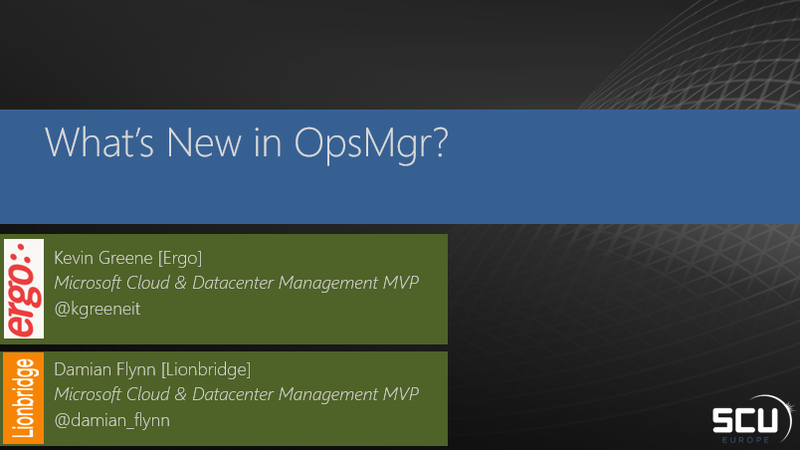 Our presentation was titled 'What's new in OpsMgr?' and included information on what's new with the current SCOM 2012 R2 build as well as everything that we know up to now for the upcoming SCOM 2016 build. As a side note, if you're watching our presentation and you're wondering why Damian keeps referencing 'glow sticks', then take a read of my 'Looking Back at System Center Universe Europe 2015' post to bring you up to speed! That's my spare time in the coming weeks used up watching and learning from all these new videos! 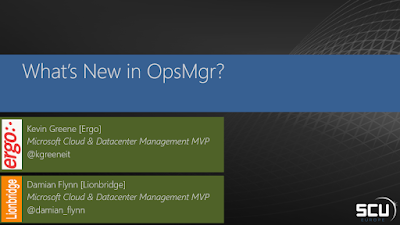 Awarded Microsoft MVP 2015 for Cloud and Datacenter Management! With everything that I've had going on lately I nearly forgot today was my MVP renewal date. I say nearly, because as an MVP, when you notice the #MVPBuzz Twitter posts stacking up in your feed, you quickly go into 'DEFCON 1' mode. In DEFCON 1 mode, you immediately begin to feel sorry for the poor F5 key on your keyboard that will undoubtedly feel the pain as the wait for the annual 'email' draws nearer and you can't help but keep frantically refreshing your email client until the mail finally arrives! 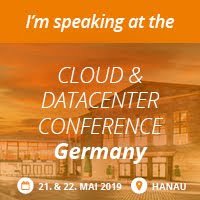 This email brings confirmation from Microsoft that I've been awarded my 4th MVP in the System Center Cloud & Datacenter space and no matter how hard you work throughout the year, there's no guarantee that you will ever see that email coming in so it's always a very welcome relief. So far over the past 12 months, I've started working on another book, been to Chicago to attend the Microsoft Ignite conference, had the opportunity to present two sessions at the awesome System Center Universe Europe conference and have been invited to present alongside some friends at the Dutch WMUG NL group. Next month I'll be heading over to Seattle to attend the MVP Summit and will then take another trip back to the Netherlands to present a session at the Experts Live 2015 event. The amount of work you have to put in blogging, tweeting, writing books, working the forums and presenting at events to obtain and hold onto an MVP is not easy (most of it is carried out on your own time after the day job is finished) but it's certainly worth it! Thanks to my family, to everyone in the MVP community for their help and advice over the last year and also thanks to my friends and work colleagues at Ergo for giving me the opportunity to work on some epic System Center projects this year too!